Dr Heather Roberts is the leading and pioneer scholar on judicial swearing- in ceremonies. In 2015 this research was showcased in her interview with Anita Barraud on ABC Radio National’s Law Report. This interview drew on her extensive and ground-breaking archival research into the origins and contemporary practice of these ceremonies in Australian Federal Courts. Her swearing-in research is part of a larger research agenda exploring the question: how does who a judge is make a difference to how the law develops? This question originally prompted her return to academia to pursue doctoral research examining the constitutional philosophy of Sir William Deane. She has continued this interest through studies of the jurisprudence of Justices Michael Kirby and Dyson Heydon, and presented and published her research nationally and internationally. Heather has served as the Secretary of the Australian Association of Constitutional Law, and ACT Chapter chair. Roberts, H 2014 Telling a History of Australian Women Judges Through Courts' Ceremonial Archives' Australian Feminist Law Journal, 40:1, 147-162. '"Swearing Mary": The Significance of the Speeches Made at Mary Gaudron's Swearing-in as a Justice of the High Court of Australia' Sydney Law Review, vol. 34, no. 3, pp. 493-510. Roberts, H 2012 'Women Judges, "Maiden Speeches" and the High Court of Australia', in Beverley Baines, Daphne Barak-Erez, Tsvi Kahana (ed. ), Feminist Constitutionalism: Global Perspectives, Cambridge University Press, New York, USA, pp. 113-131. Roberts, H 2011, 'A Mirror to the Man Reflecting on Justice William Deane: A Private Man in Public Office', Adelaide Law Review, vol. 32, pp. 17-46. 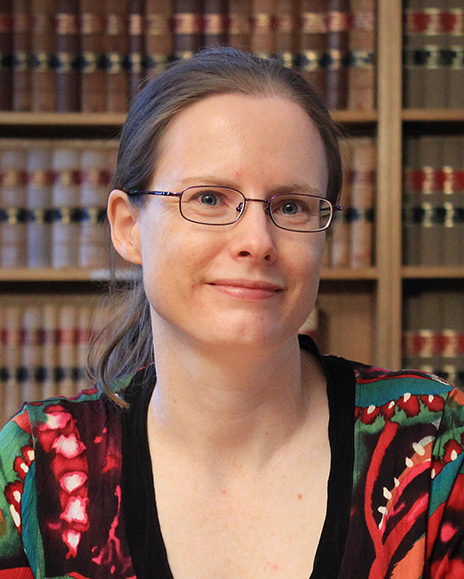 Dr Heather Roberts has received a Discovery Early Career Researcher Award (DECRA) from the Australian Research Council to undertake extensive research into the records of Australian judicial swearing-in ceremonies dating back to Federation. ANU Law has launched the Unrequired Reading List, a curated list of books, films, texts and artworks intended to complement students’ study of the law. Dr Heather Roberts is the leading and pioneer scholar on judicial swearing-in ceremonies. Australia’s leading and pioneer scholar on judicial swearing-in ceremonies. In 2018 my project ‘The Ideal Judge’ received $335,983 DECRA (Discovery Early Career Researcher Award) funding from the Australian Research Council. The project is the first of its kind, world-wide, using ceremonies drawn from across Australia’s Supreme Courts, form 1901 to the present day, to explore changing expectations of judges and judging. These ceremonies captured my interest as an undergraduate law student, and this project is the culmination of my sustained efforts in transforming the perception of them as ‘mere puff’ to a source of rich legal and social history. In addition to the passion I bring to their study, my research builds on my strengths in public law, legal and judicial biography and gender studies. With this foundation, and the project promises new insights into the backgrounds and attributes of those who have exercised judicial power in the future and to inform to inform debate – in academia and in the community at large - about what is required in judges and judging in the future in order to maintain public confidence in the judiciary. In 2015 this research was showcased in her interview with Anita Barraud on ABC Radio National’s Law Report. This interview drew on her extensive and ground-breaking archival research into the origins and contemporary practice of these ceremonies in Australian Federal Courts. In particular, the interview focused on how her research uses swearing-in ceremonies to tell a rich narrative history and biography of the Australian legal profession and the judiciary, including the changing attitudes towards women in the law in Australia. Following the swearing-in of Chief Justice Susan Kiefel as Australia's first female Chief Justice of the High Court, she provided live television commentary, radio interviews, as well as academic commentary on this key event in Australian legal history. Dr Roberts was elected as Council Member and Secretary of the Australian Association of Constitutional Law and has served as Treasurer of the ACT Tenant’s Union. Michael Coper, Heather Roberts, James Stellios (eds) The Tasmanian Dam Case 30 Years On: An Enduring Legacy Sydney: The Federation Press, 2017 (in press) (ISBN: 97817600208280). Heather Roberts ‘Chapter 7: Law Through the Lens of Biography’ in James Stellios (ed) Encounters with Constitutional Interpretation and Legal Education: Essays in Honour of Michael Coper Sydney: The Federation Press, 2018 (ISBN: 9781760021627). Michael Coper, Heather Roberts, and James Stellios ‘Introduction’ in Michael Coper, Heather Roberts, James Stellios (eds) The Tasmanian Dam Case 30 Years On: An Enduring Legacy Sydney: The Federation Press, 2017 (ISBN: 97817600208280). Gabrielle Appleby and Heather Roberts (2016a) ‘Chapter 2: Law and Literature, Analysing Style in Judgment Writing’ in Gabrielle Appleby and Rosalind Dixon (eds) Constitutional Critical Thinking: Rereading Monis Sydney: The Federation Press, 2016, pp. 28-42. Gabrielle Appleby and Heather Roberts (2016b) ‘“He who would not be muzzled” Justice Heydon’s Last Dissent’ in Andrew Lynch (ed) Great Australian Dissents Cambridge, UK: Cambridge University Press, 2016, pp. 335-354. Heather Roberts (2012a) ‘Women Judges, “Maiden Speeches,” and the High Court of Australia’, in Beverley Baines, Daphne Barak-Erez, Tsvi Kahana (eds), Feminist Constitutionalism: Global Perspectives Cambridge, U.K.: Cambridge University Press, 2012, pp. 113-131. Heather Roberts and John Williams (2011a) ‘Constitutional Law’ in Ian Freckelton and Hugh Selby (eds), Appealing to the Future: Michael Kirby and His Legacy Sydney: Thomson Reuters, 2011, pp. 179-216. Margaret Thornton & Heather Roberts (2017a) ‘Women Judges, Private Lives: (In)visibilities in Fact and Fiction’ University of New South Wales Law Journal vol 40, no 2, 2017 (accepted 4 March 2017). Andrew Macintosh, Heather Roberts & Amy Constable (2017b) ‘An Empirical Evaluation of Environmental Citizen Suits under the Federal Environment Protection and Biodiversity Conservation Act 1999’ Sydney Law Review (accepted 1 November 2016). Heather Roberts ‘Telling a History of Australian Women Judges Through Courts’ Ceremonial Archives’ Australian Feminist Law Journal vol 40, no1, 2014, pp. 147-162. Heather Roberts (2012b) ‘“Swearing Mary”: The Significance of the Speeches Made at Mary Gaudron’s Swearing-in as a Justice of the High Court of Australia’ Sydney Law Review vol 34, no 3, September 2012, pp. 493-510. Heather Roberts (2011b) ‘“A Mirror to the Man”, Reflecting on Justice William Deane: A Private Man in Public Office’ Adelaide Law Review vol 32, no 1, 2011, pp. 17-46. Heather Roberts ‘Law Through the Lens of Biography’, New Ways Forward: Reform and Renewal in Constitutional Interpretation and Legal Education (Conference in Honour of Professor Michael Coper), Canberra, 2 December 2016. Margaret Thornton and Heather Roberts ‘Women Judges, Private Lives: (In)visibilities in Fact and Fiction’ Spectacular Law, Australasian Law, Literature and Humanities Association Conference, University of Hong Kong, 10 December 2016. Rachel Cahill-O’Callaghan and Heather Roberts ‘Values and Agreement in the High Court of Australia’, Society of Legal Scholars Conference, University of Oxford, Oxford, 9 September 2016. Margaret Thornton and Heather Roberts ‘Women Judges, Private Lives: (In)visibilities in Fact and Fiction’, Law and Culture Conference, St Mary’s University, London, 5 September 2016. Heather Roberts ‘From Oddities to Ordinary? The Legal Profession's Changing Attitudes to Women Lawyers in Australia’, The Futures We Want: Global Sociology and the Struggles for a Better World, 3rd International Sociology Forum, University of Vienna, Vienna, 14 July 2016. Gabrielle Appleby and Heather Roberts ‘Critical Thinking Through Theory and Rereading’, Public Law in the Classroom, University of New South Wales, Sydney, 11 February 2016. Gabrielle Appleby and Heather Roberts ‘“He who would not be muzzled” Justice Heydon’s Last Dissent’ Great Australian Dissents Workshop, University of New South Wales, Sydney, 10 June 2015. Heather Roberts ‘Women Judges ‘Maiden Speeches’: Telling a History of Women Judges Through Judicial Swearing-in Ceremonies’, Society of Legal Scholars Conference, University of Nottingham, Nottingham, 11 September 2014. Heather Roberts ‘What makes a Good Judge? A Comparison of Australian and Japanese Judges’ Biographical commentaries', Australian Network for Japanese Law Workshop, Cairns, 15 May 2014. Heather Roberts ‘Why we Should use Swearing-in our Teaching’, Australian Law Teachers Association Conference, Australian National University, Canberra, 30 September 2013. Heather Roberts ‘“Telling Tales’”: How Judges’ Lives are told at High Court Swearing-in Ceremonies’, The 8th Biennial Conference of the International Auto/Biography Association, Australian National University, Canberra, 18 July 2012. Heather Roberts ‘“Portentous Words”: The Significance of High Court Swearing-in Ceremonies”, 2011 Joint Conference of the Law, Literature and Humanities Association of Australasia and Law and Society Association of Australia and New Zealand, University of Wollongong, Wollongong, December 2011. Heather Roberts ‘Women Judges, “Maiden Speeches”, and the High Court of Australia’, International Conference on Feminist Constitutionalism, Queens University, Queens, 1 March 2009. Heather Roberts “Deane – A Sideways Glance”, Legal Biography Symposium, University of Adelaide, Adelaide, 4 December 2009. Heather Roberts ‘“A Mirror to the People’: Swearing-in ceremonies as commentary on the History of the High Court of Australia and its changing role in the Australian Legal System’, Australia and New Zealand Law and History Society Conference, Wellington, 10 December 2009. Heather Roberts (2017a) ‘Chief Justice Susan Kiefel: Swearing-in Ceremonies and the Importance of Firsts’ LSJ (Law Society of New South Wales Journal) Issue 31, March 2017, pp. 78-79. Heather Roberts and Laura Sweeney ‘Why (Re)Write Judgments: Australian Feminist Judgments’ Sydney Law Review vol 37, no 3, September 2015, pp. 257-266. Heather Roberts ‘Australian Feminist Judgments: Righting and Rewriting the Law, edited by Heather Douglas, Francesca Bartlett, Trish Luker and Rosemary Hunter. Oxford: Hart Publishing, 2015, 382pp (£35 paperback). ISBN: 9781849465212. (pages 558–565)’ Legal Studies vol 35, no 3, September 2015, pp. 558-565. Heather Roberts ‘Caselaw and the High Court’ Legaldate vol 22, no 1, March 2010, pp. 7. Heather Roberts ‘Fundamental Constitutional Truths: The Constitutional Jurisprudence of Justice Deane, 1982-1995’ (thesis submitted in completion of PhD), July 2008. Heather’s teaching is informed by her experiences in compulsory courses: courses with deserved reputations for being demanding and complex, and undeserved reputations for being dull and irrelevant to students’ lives post-university. Heather’s inspiring teaching is challenging these assumptions. Blending a carefully constructed skills-based approach to course content, a rigorous but encouraging learning environment, and a genuine and infectious enthusiasm for her research and her teaching, students leave Heather’s classes with renewed confidence in their abilities and new perspectives on law and judicial reasoning. My current research connects with public policy by interrogating the question: how does the personal identity of a judge make a difference to law and legal systems?